The term “hash” may come from the French verb hacher, meaning to chop or grind. Usually referring to a dish including potatoes, onions and meat, hash became popular around World War II when meat rationing was in effect. Presumably precious amounts of meat were extended by the addition of other vegetables, and served alongside eggs or toast. Today, you hear the term ‘hash house’ as a reference to an inexpensive restaurant or diner. 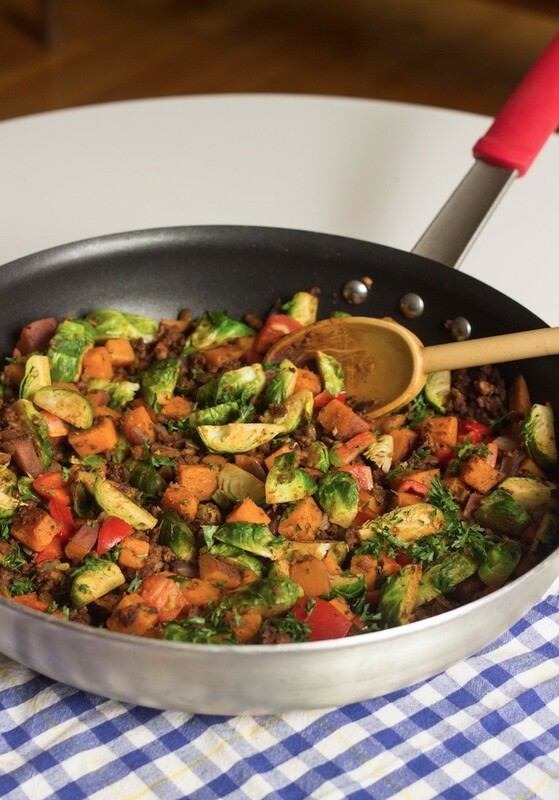 This hearty, meat-free vegan sweet potato hash recipe includes veggie crumbles and fall vegetables in a one-dish meal I enjoyed for both breakfast and lunch. It would also be delicious served over polenta or grits. In a medium pot, bring eight cups of water to a boil. Add sweet potato and cook until soft, about 8-10 minutes. Drain. In a large skillet, heat olive oil. Add red onion and garlic and saute about 2 minutes. Stir in veggie crumbles, paprika and cayenne and cook another 3 minutes. Add in brussel sprouts and cook another 5 minutes, stirring occasionally. Stir in red pepper and sweet potatoes and continue cooking another few minutes or until all vegetables are cooked through, but still firm. Stir in salt, lemon juice, parsley and pepper and serve. Thank you so much, Julia! I so agree it would make for a perfect side dish. Great idea! I had a few problems with this recipe. I just attempted to make it, and couldn’t find “veggie crumble” anywhere. If you have a nickname for something, please don’t put it under an ingredient list without saying what it is. I looked up “Yves,” which was found on another site for this same recipe, and it’s all replacement meat, yet again no mention of a “crumble” for me to buy. Also, the recipe doesn’t say when to put in the Sweet Potatoes! I just made it and it was Way too spicy. Made my mom who was helping me almost choke!